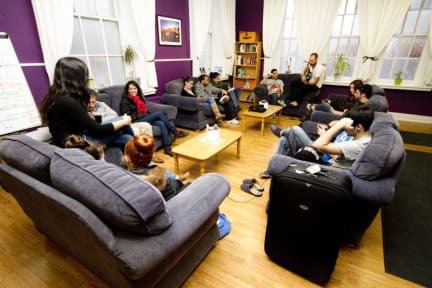 Dublin International Hostel is part of Hosteling International and YHA. We are at the heart and start of backpacking and hosteling in Ireland with over 85 years commitment to you and your adventures. The Dublin International Hostel is a listed building that was once the St Josephs Convent School and Church for the local community. Plan your day out in Dublin over your free breakfast in our Church, make your own dinner or lunch in our self catering kitchen which was once the scullery for the Sisters who lived here. Remember to say Hello to Saint Joseph as you walk up the stairs and through the Georgian Double Doors into the hostel. Watch a show, listen to music new and traditional, meet new people and have the craic.. I would absolutely recommend this hostel. You're in the center of Dublin and of course it is not a hotel, but I have nothing to make complaints over, everything was great. Great value for the money, would come back again. Really nice and helpful staff and people there. Impressive historic building in ok condition. Clean beds, good breakfast and we will definitely come back a third time!! Es ist ein grosses Hostel, mit vielen Betten. Der Dusche war genial. Sonnst alles okey für den Preisverhältnis. Kopfkissen sollte bei Möglichkeit erneuert werden, da er so flach war. We had a great stay, the staff there was very friendly! Just the toilets wewrn't that clean, the bin in the bathroom could be emptied more often. I came to this hostel few years ago, it was much more cleaner specially the beds but the breakfast ist okay and the stuff is very friendly. The usage of the lockers is way too expensive. Most of the staff is very friendly, but the atmosphäre wasnt that great. The Hostel provided with everything you need: dorms, showers, fully equipped kitchen. But there was nothing special about it. Everything was very old and the showers were at the point were you should think about renovating them. Unfortunately we had some other guests in our room who were really disrespectful. They had to take a flight in the early morning and started packing their luggage at 3 am. So we slept very bad that night. The hostel is situated a little borth of the northern city center, so it‘s not right at the heart of the action but a short 10-15 minute walk away. They have good security and staff was overall friendly and helpful. Unfortunately that‘s it with the good things. In general, it was not very clean, not the rooms nor bathrooms. Facilities were not well maintained and often dirty. The provided bedsheets felt like a joke, especially for the blanket (it‘s the same kind of cloth as for the mattress).